Spanish verbs are conjugated according to tense (present, past, etc.) and mood (indicative or subjunctive.) How they are conjugated depends on whether the verb is of the –ar, –er, or –ir variety. We spend our first few weeks in Spanish 101 learning how to conjugate three typically regular examples of those verbs, hablar, beber, and vivir. The stems of these regular verbs are habl-, beb-, and viv-. Since these verbs are regular, they follow a consistent pattern in building our conjugation skills and helping us learn the various tenses (present, preterite, imperfect, future, etc.). Better yet, those stems (habl-, etc.) remain constant, no matter what form of the verb we use. This is not the case with stem-changing verbs, though. 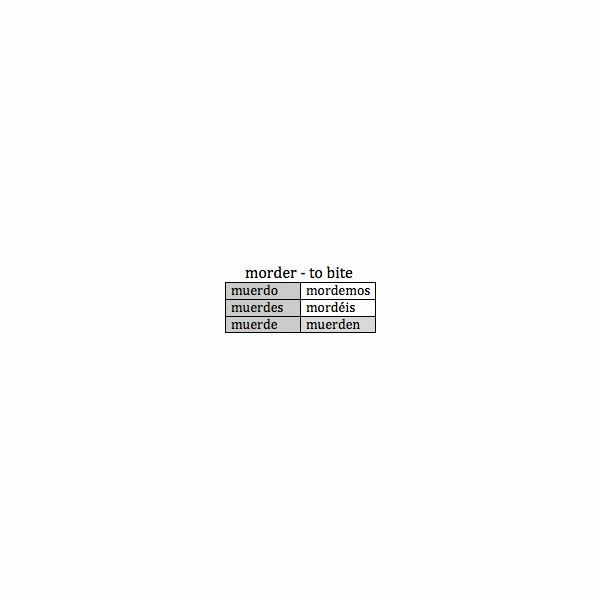 Let’s look at the stem-changing verb morder (to bite) as an example of a stem-changing verb. The stem of morder is mord– . The stem spelling changes to muerd– (O goes to UE) in the first and second person singular (yo and tú) and the third person singular and plural forms (él, ellos, etc.) of the present tense. As we shall see, in other verbs we get stem-changes where E goes to IE and I goes to E in the same conjugated pattern. If we listed the conjugated forms of the verb in a table with singular forms on one side and plural on the other, we could draw a boot-shaped figure around the changed stem spellings. Stem spelling changes in Spanish would seem at first blush to be random, but there is a pattern. What, for example, would the verbs contar and volver, cerrar and sentir (all verbs that have stem changes) have in common? The answer has to do with how Spanish prefers to soften stressed vowels in verb stems when the verb is conjugated. Contar and volver become cuento and vuelvo in the first person, because the first syllable of the verb form is stressed (CUEN-to), and whoever made up the rules decided that it sounded better with the softer combination UE (diphthong). Note that the first and second persons plural (-amos, áis; -emos, -éis) forms do not change. That is because of the the stress of these forms moves to the second syllable. 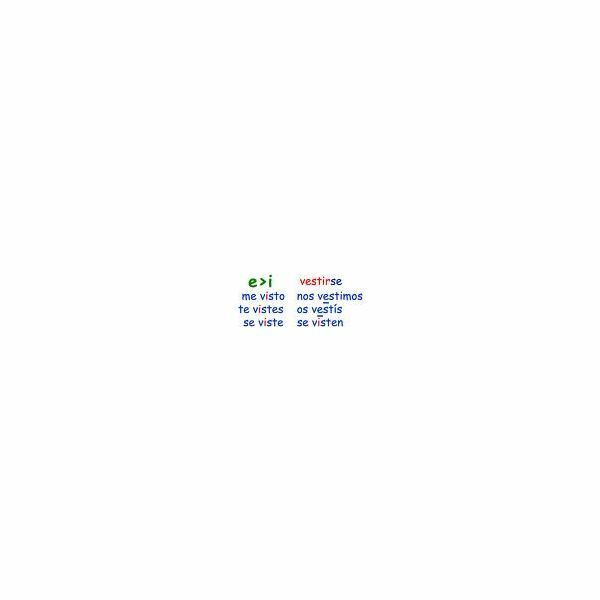 Other E to I changing verbs include vestirse (to get dressed), conseguir (to get), repetir (to repeat), elegir (to elect), freir (to fry), servir (to serve), and sonreir (to smile). As we have seen, some stem-changing verbs fall into a recognizable pattern. But that is not particularly helpful to the beginning learner. It is easier, then, to learn each new stem-changing verb as it is encountered. As our experience and skills in Spanish increase, so does our “ear" for these stem-changing verbs. It just sounds better to say vuelven rather than volven. You need to know the first person singular of every Spanish verb so that you can learn subjunctive mood conjugations. Spanish uses the subjunctive mood (to express desires or the hypothetical) far more extensively than English. For example, to say “It is important that you return early” in Spanish, you would need the subjunctive second person singular of volver. The sentence would read: “Es importata que vuelvas temprano.” We need to know that the present tense, first person of volver is vuelvo before we can attach the subjunctive verb endings. Go see Spanish Whiz’s great web page for a good listing of our stem-changing verbs. Also, StudySpanish.com has a nice explanation and examples of stem-changers.